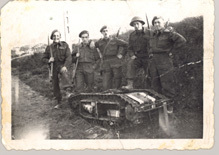 Soldiers from the Régiment de la Chaudière pose with a captured German Goliath remote-controlled demolition vehicle outside Boulogne, France on 25 September 1944. During the Second World War, more than 160,000 French Canadians volunteered to serve in the three armed services, representing just over 20% of Canadians serving overseas. (see The Canadian Armed Forces) The majority of French Canadian soldiers who fought overseas did so as part of one of four Francophone infantry units: Les Fusiliers Mont-Royal, Le Régiment de Maisonneuve, Le Régiment de la Chaudière, and the Royal 22e Régiment. Others served in the 4th Medium Regiment, Royal Canadian Artillery. In these units, French was the everyday working language, but administration and communication with other units took place in English. A significant number of Francophones also served in two Quebec armoured regiments, the Three Rivers Regiment and the Sherbrooke Fusiliers Regiment, which were also sent overseas. Starting in 1942, a largely Francophone squadron served in the Royal Canadian Air Force. Number 425 (“Alouette”) Squadron flew bombers as part of the Canadian 6 Group in the Royal Air Force’s Bomber Command. (see The Bomber Offensive) In the Royal Canadian Navy, no ship had a fundamentally Francophone crew during the Second World War. French Canadian sailors were therefore spread across the navy’s bases and ships. Much the same held true for the Merchant Navy. Like their comrades in the air force and the two armoured regiments mentioned above, sailors needed a good knowledge of English. Numerous Francophone units were also mobilized for the defence of Canada. These units were sent to the Gaspé region, in Quebec, to the Atlantic and Pacific coasts, and to Newfoundland, which did not become part of Canada until after the Second World War. Other units, such as the Voltigeurs de Québec and the Régiment de Châteauguay, were sent to the United Kingdom to provide reinforcements for Francophone units fighting in Europe. In the war against Japan, French Canadian soldiers from the Régiment de Hull participated in the invasion of Kiska, located in Alaska’s Aleutian Islands. (see The Aleutians Campaign, 1942-1943) A number of French Canadians also served as secret agents behind enemy lines in Europe, and later in Japanese-held territory in South East Asia. "Ce qui presse: égalité de traitement, des chefs, un drapeau"
"L'allocation de Pie XII au "22ième" régiment"